Zonkeys, ligers: The sad truth about animal hybrids. The sad truth about animal hybrids. 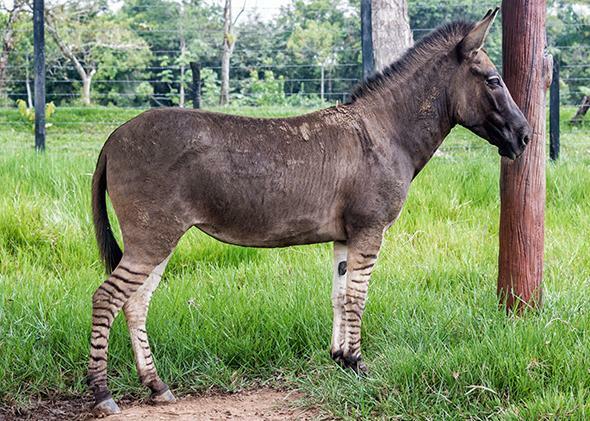 A zonkey, a cross between a donkey and a zebra, seen in Colombia. 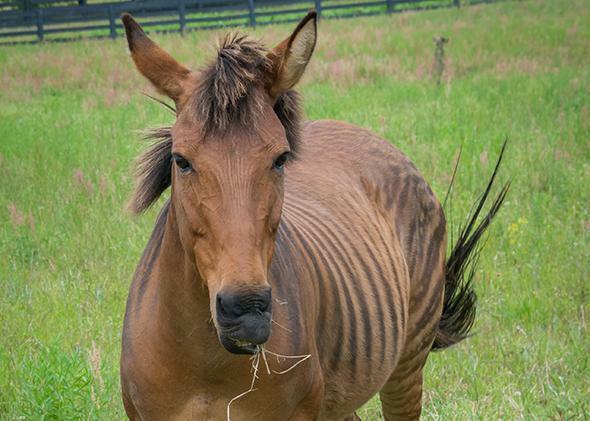 Mix a zebra and a horse, and you get a zorse. Swap the horse for a donkey, and you have yourself a zonkey. When a pony and a zebra love each other very much, you wind up with a zoni. It’s fun to think of animal hybrids as the Reese’s peanut butter cups of nature. You take a little of this and mix it with a little of that, and voilà—you get an end product more interesting (and delicious?) than the creatures you started with. But hybridization has its costs. Zebroids—the name for any zebra-based hybrid—are almost always infertile, and they sometimes suffer from dwarfism. Perhaps this isn’t so surprising. While horses, zebras, and donkeys look similar and belong to the same genus (Equus), each species has a different number of chromosomes. So just because you can interbreed them doesn’t mean you should. And that Ian Malcolm-ian sentiment resonates across the world of hybrids. Take ligers, the chimera created by a lion and a tiger, popularized at least in part by a cameo in the not-quite-cult-classic Napoleon Dynamite. Whereas zebroids can run small, ligers suffer from unsustainable growth. 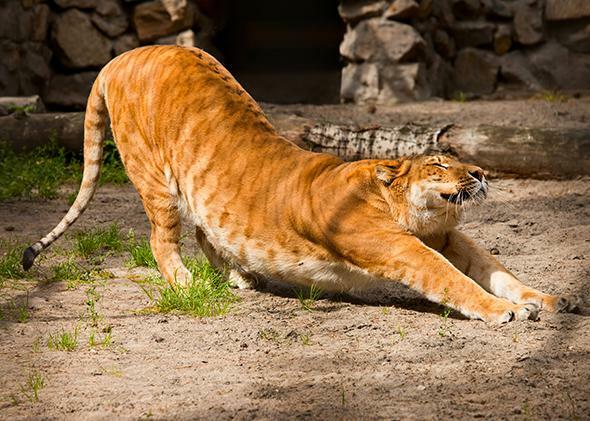 A liger, a mixture between a lion and a tiger, stretches. Big Cat Rescue has cared for numerous hybrids over the years, including a liger that has since died. Bass says any hybridization between big cat species is irresponsible breeding at its worst, a deed done only for greed and with absolutely no conservation value. “They are bred for lives in a cage. They’re never going to be released into the wild. There is no wild for these cats,” she says. The liger is only one such concoction, by the way. There are also tigons, which is a cross between a female lion and a male tiger. (Ligers are technically the opposite.) Then you have leopons (leopard plus lion), jaguleps (jaguar plus leopard), and savannah cats (domestic cat plus serval). Or you can smush a female liger with a male lion and get a liliger. Same goes for mating a female tigon with a male ligon, the offspring of which is called a litigon. Tiligers, titigons. And on. 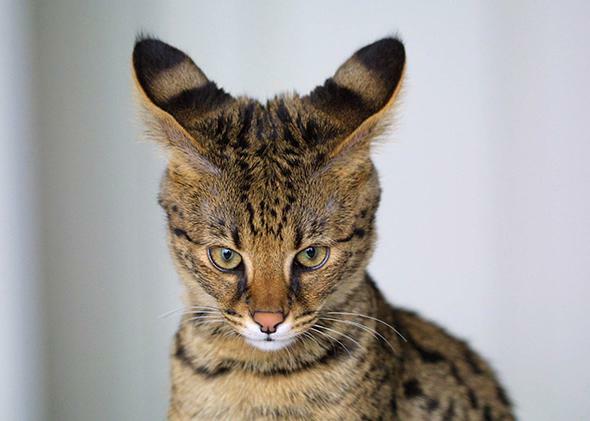 A closeup of a four month old Savannah Cat, a hybrid of a domestic cat and serval. Basically, if you put a couple of kitties together for long enough, something will pop out, and people will shell out cash to see it. And, according to Bass, it’ll probably have birth defects, die young, or end up in a rescue organization like Big Cat Rescue. But big cats aren’t the only cash cows. In the Middle East, the money mammal is the camel. Camel racing and camel beauty pageantry—seriously, it’s a thing—are now fueling an interest in more controlled and more effective camel breeding. Camel milk is also an up-and-coming industry, with some bottles already available for purchase in the United States. But it’s safe to say that if you’ve heard of the Camel Reproduction Centre in Dubai, it’s probably not for any of the aforementioned reasons. No, you know them for the cama. The cama is a hybrid made from a camel and a llama. Because at this point, well, why the hell not? Camas are sort of like llamas that have nibbled Eat Me cake. They’re bigger than normal llamas but not quite as sizable as camels. They lack humps, but they do seem to have a thicker bone structure than llamas. Their other features also split the difference between the parents. Camels have short ears, llamas have long ones, and camas’ are medium-size. Camels have round feet, llamas’ are cloven, and the cama’s again lie halfway between. The coat is long-haired and llama-y while the tail is more camelicious—which is also the name of a popular camel milk brand, FYI. I don’t know—seems like a lot of work for a little extra wool. It is possible, of course, for hybrids to occur without human intervention. For instance, the coyotes that have spread across the eastern U.S. over the past 70 years actually have a hefty helping of wolf and domestic dog genes. Africanized or “killer bees” were created by humans but persist in the wild. Marine iguanas have lain with land iguanas, there’s been hanky-panky between hooded seals and harp seals, saltwater crocodiles have gotten busy with Siamese crocs, and six types of gulls have been known to dabble in extra-species sexcapades. “Love is blind,” jokes Andrew Derocher when I called him to confirm the existence of pizzlies—a hybrid between polar bears and brown bears, or grizzlies. A zorse, a hybrid of a horse and zebra. Derocher is a polar bear expert and professor at the University of Alberta. He says he’s seen a handful of the hybrids in person but that there’s evidence the crossover has been happening on and off for thousands of years. How, exactly, do a polar bear and brown bear join reproductive forces? Derocher isn’t sure. It’s likely, though, that the pair is a result of a male grizzly and a female polar bear. For one, the sizing would match up a little better—polar bears are larger than grizzlies, and males of both species are larger than females, so a male grizzly and a female polar bear wouldn’t look all that awkward in a prom photo. And two, grizzlies are epic bullies. “At bowhead whale carcasses, where grizzly bear and polar bear territories overlap, you’ll see the grizzlies basically dominate the carcass,” says Derocher. “They push polar bears around like crazy.” Does that mean male grizzlies might also actively out-compete male polar bears for mates? We don’t know. Perhaps we’ll find out if such hybridization becomes more common with the onset of climate change, as some project. Actually, there’s a good chance you’re a bit of a hybrid yourself. Scientists now think our ancestors nookied around with Neanderthals some 30,000 years ago, and some of us retain portions of their DNA as a result. In other words, if you’re of European or Asian descent, up to 4 percent of your DNA may come from another species. All we need now is an annoying portmanteau to go with it. Say it with me now: Numan!